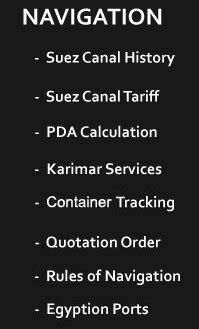 Karimar shipping agency one of the leading shipping Agency in Egypt established to render ample range of shipping and logistic Business to all our clients heading Suez Canal Area and all Egyptian ports. We aim to render shipping & logistic services with competitive of both price and quality. Looking to give our clients integrated services all over the Egyptian Ports and Suez Canal Area. 1 – Suez Canal Transit Agent with worldwide bases. 8 - Crew Manning Agent & Management. Our Main office located in Port Said at the mouth of the great Suez Canal while the others branches located at over Egypt (Suez – Damietta – Alexandria - & Red Sea Ports). Would like to cooperate together and you will be highly satisfactory. We have a wide range of activities and services to meet our clients needs and serve them A to Z.